Breathing Apparatus hire means you do not have to calibrate, maintain, or record equipment you do not regularly use. Given the regulagtory controls over this kind of kit and the burdensome expense that ownership will bring, it is hardly surprising that our hire services have proved increasingly popular, during the twenty-one years we have offered this service - originally at the request of some of our largest customers. To check out which equipment is available for hire, check out the relevant product page, for specifications. YOU MAY NOT HIRE EQUIPMENT FROM US UNLESS WE HAVE FIRST TRAINED YOU TO USE IT SAFELY, or unless you have an acceptable note of training for the equipment. 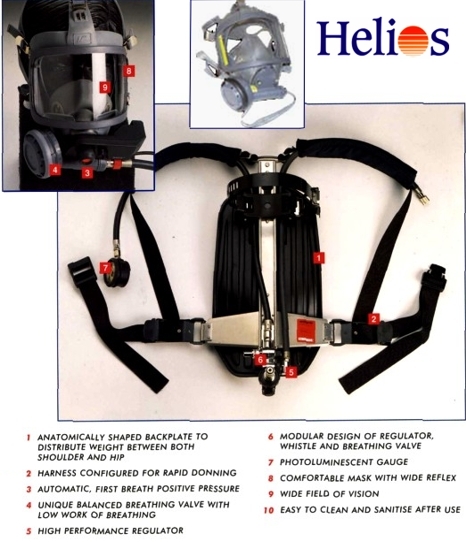 Helios has more than twenty years experience in hiring out safety equipment for Diving, Confined Spaces work, Fall-arrest, Extrication, Resuscitation and Rescue and, you may be sure, the equipment we select for our hire stock has been chosen not for its purchase price but for its robustness, suitability, reliability, longevity and versatility. For these reasons, the Gas detection brands we hire-out include ranges from RAE and BW Honeywell: breathing apparatus from Interspiro, Fall arrest and access equipment from PETZL, ABTECH, SARS and Globestock Engineering. Our MOTIVOX Oxygen therapy and resuscitation equipment is made by us: we believe it the most robust and effective kit in the World -suitable for use underground, even under water and certainly, under pressure! Our Hire customers include many of the most active firms in Energy production, Commercial Diving, Oil and Gas drilling and Well management, Industrial refrigeration and water utilities. Our Hire service offers flexible arrangement for both the hire period and the service level. These details are reproduced hereunder, in 'Terms & Conditions'. A time scale based, variable rate offers price breaks at weekly, monthly and quarterly hire periods. The standard, weekly hire rate is discounted, pro-rata, by 25%, for monthly hire and by a further 10%, for quarterly hire periods. 'Service Plus' arrangements include 24 hour, emergency replacement, field service and safe usage training for up to twelve personnel. Delivery & collection charges are made only where equipmment is not collected from and delivered back to our premises. Hire Agreement between Helios (Safety & Rescue Products) Ltd. known hereafter as the Company and parties accepted by it as hiring its property, hereafter known as the hirer: Wherein it is agreed that the Company will allow the Hirer unimpeded, the proper use and benefits of the equipment scheduled and appertaining to the agreement and hereafter known as the property; during an agreed Hire period and that the Hirer shall enjoy the benefits of any warranty or service offered with the property provided that the equipment is used according to its instructions and within its limits of use, such as may be published by its manufacturer and notified by the company. This agreement takes place under the Laws of England and the property may not be used outside the British Isles unless by the prior and express agreement of the Company in writing. The agreement is otherwise than herein according to the Company's General Conditions of Sale, a copy of which is available on request and which do not affect the Hirer's Statutory rights. Title to the property: During the Hire period, the property shall remain the company's and the Hirer shall be responsible for ensuring the equipment is kept in appropriate conditions and in good, serviceable order. There is no means by this agreement for the property to pass to the Hirer, other than by a further written agreement with the company for a Bill of Sale up on or immediately after termination of this agreement. Assignation of the agreement. The agreement may not be assigned, sub-let, contracted or granted to a third party. In the event of the Hirer's business changing ownership or by other change to the agreement, it will be deemed void and the property immediately returned to the company at the Hirer's expense. Where the company has entered an agreement which includes maintenance, this shall not mitigate the Hirer's responsibility to ensure the equipment is properly functional and used according to the instructions or accordingly with any Regulation of English Law providing for its safe use. Health, Safety & Insurance. The Hirer undertakes to ensure that all those authorised to use the property have adequate experience and are appropriately trained to be competent within the meaning of the Health & Safety at Work Act...(1974). The Hirer also undertakes to mitigate the company against any claim arising from the incorrect or unauthorised use of the property and to insure its loss by accident or wanton damage according to the value given by the company to the Hirer. Hirer's Obligation as Keeper. The Hirer undertakes to keep the Company informed as to the whereabouts of the property, his correct address and liaison details and to permit the Company access to inspect or repair the property at the Company's reasonable demand. The Hirer shall not pledge the Company's credit to a third party particularly against the repair of the property and, in any case, for any other reason. Hire periods less than a month will be "Hire only". Fully repairing Hire and Service Plus Hire are offered only with hire periods exceeding one month. To provide for a hire charge the property in sound and serviceable condition at the commencing of the Agreement according to the terms here mentioned, having ascertained the property suitable for the purpose of its use so far as practicable by information provided from the Hirer. The Hirer may contract a maintenance agreement separately with the Company or another agency approved by the Company, so far as may be necessary. To provide property according to the "Hire Only" agreement except that the Company additionally undertakes to Maintain and Repair the property according to Government Regulation or the Manufacturer's instructions, whichever is appropriate. This is performed at intervals of six months, usually at the property's location (advised by the Hirer) after which Maintenance records are kept by the Company and advised to the Hirer. This agreement does not cater for the provision of replacement equipment during maintenance nor for any maintenance which may be required between scheduled visits, nor for the repair or replacement of the whole or part of the property accidentally or wilfully damaged. This type of agreement offers all the benefits of the "Fully Repairing" agreement and, in addition, caters for the provision of replacement equipment during necessary maintenance and breakdown periods at a maximum notice period from the Hirer, of 48 hours. This agreement also mitigates the Hirer from responsibility for accidental damage to the property but not against loss through negligence, theft, fire, flood, explosion or from wilful damage. The company will determine any damage to be covered by the agreement and its decision will be final. 1 Payment of a deposit amounting to ten weeks rental shall be made prior to delivery of the equipment; unless the hirer holds a credit account with the company. There will follow weekly or monthly, payments, in advance of the next weekly or monthly hire period, to the Company immediately upon its presenting the due invoice. The Hire period may be any period agreed between the parties but it will normally be considered in whole weeks, subject to the detail of the company's Hire List from time to time amended and available on request by the Hirer. A month shall be regarded as four weeks. The company shall be entitled to recover the property immediately should payment fall more than thirty days in arrears where after the Hirer shall not be entitled to the benefits of the agreement nor to the return of any outstanding deposit. Payment for the agreement shall be paid by cheque, Bank transfer, or acceptable Credit Card. VAT will be chargeable at rates determined by English law. 1 The bankruptcy, insolvency, cessation of business or criminal conviction of the Hirer or his officers in Law. 2 A change in ownership or the legal construction of the Hirers entity or business. 1 The Hirer may terminate the agreement when his account is in good standing and having given at least 3 days written notice that he can demonstrate the company has been unable to competently undertake its obligations to him, without further obligation to pay the company after having returned its property. 2 The currency of the agreement ends at the due date and requires no further notice than given herein. 6 Notice of termination, except through expiry of the agreement, shall be served by registered letter and deemed effective from the date of receipt of the notice. 1 Neither party shall be entitled to pursue consequential damages from the other save those that are incurred particular to the property hired regarding its safe and proper function. 2 The property shall be returned to the Company immediately up on Termination. 3 In the event that the company is declared insolvent, bankrupt or to have ceased to trade, the property shall be returned to the company's officers, after due notice and the agreement will terminate without further obligation to either party. 4 Any outstanding Deposit will be refunded at the discretion of the company's officers and will only be considered where the agreement has terminated after half its period has elapsed but less than one eighth remains outstanding. The Period of the Agreement and the Schedule of property (Equipment hired) is defined by the company's invoice or works order. Hire is undertaken only under the foregoing terms unless otherwise agreed in writing. Click the button below to add the Breathing Apparatus, SCBA, with cylinder; weekly Hire to your wish list.